My Kenyan pal came and sat next to me at a conference. She rummaged through her bag, before suddenly standing and heading out of the conference room- she had left her expensive camera at the table where she was having tea, outside the large conference room. she came back a while later with her camera. She told me if this was Nairobi, for we were in Kigali, she would not have found it. 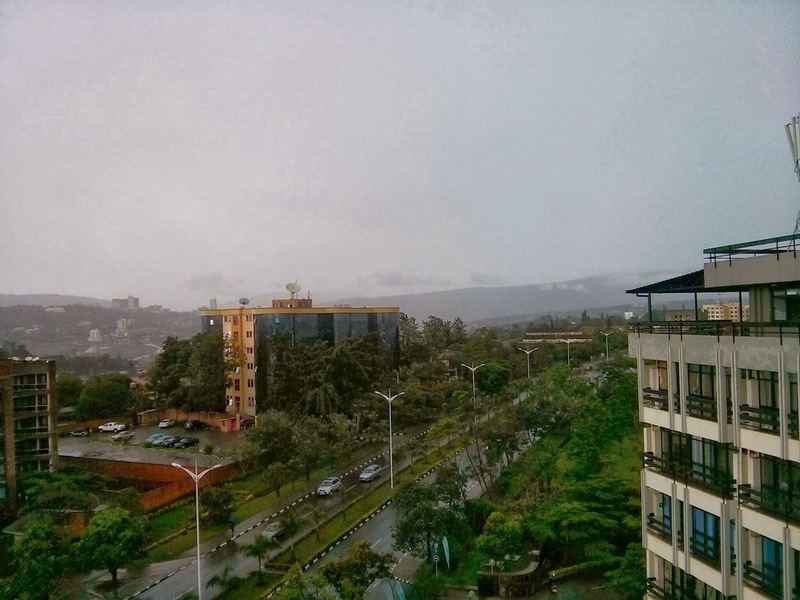 Kigali might be a small city, of 1 million residents, in the country of 12 million. Rwanda's 12 million might not seem many compared to Kenya's 40 million, Ethiopia's 90 million or Nigeria's 168 million. They however are the most populous country - by virtue of population density at 400 to 407 people per square kilometre, due to the country's size. Kigali though, small as it may look like - It appears built out over a series of hills surrounding one hill - is quite spacious compared to Nairobi. A good number of streets are wide, and there are few people and cars on them. This contrasts with Nairobi, where sections of the Nairobi are so full of people, it resembles ants scampering out ot of an anthill in times of trouble. Standing at Telecoms House at KG 7 Avenue as the sun sets, one can clearly see that Kigali spreads over four or five hills (Wikipedia says they are four). One would swear that Kigali is a small city in size, but many will be surprised to hear that Kigali, at 700 kilometres squared is the same size as Nairobi. Nairobi as an administrative unit goes as far as the Northern By-Pass on Kiambu Road, just before Ruaka on Limuru Road, Kabete Campus (School of Business) on Lower Kabete road, Uthiru Market on Waiyaki Way, Dagoretti Police Post on Dagoretti Road, Deliverance Church (after Embulbul on Ngong Road), and he river after Laiser Hill School on Magadi Road. Also just left out are Mlolongo, Syokimau, with the border crossing Kangundo road at Deliverance church(before Makongeni AP camp) before getting onto Thika Road at Clay Works (between Kasarani and Githurai 45). It then runs along Thika road all the way to the end of Kenyatta University, before heading to cross over Kamiti Road after Kahawa West. As such, some populous areas off Lower Kabete road, Waiyaki Way and Thika Road aren't considered as part of Nairobi. Still, a large part of Nairobi is still contained within the administrative unity of the city. That should give you a rough estimate of Kigali's size. However, with 3.1 million people in Nairobi, the city has four times as many people as Kigali in a square kilometre. Off the roads, you will spot the better side of Kigali, but branching off the road may lead you to one or two room clay houses, without electricity. If I am not wrong, there is a government programme to replace some of these buildings with better off structures, especially those located in more frequented areas. Second thing about Kigali is the organisation - yes, there may be lots of low income areas with not well-to-do houses, but these are better off than your average Nairobi slum. The roads are well organised, and there is some sort of city numbering system for the roads. Roads in the city are wide, well marked, and well lighted at night. The streets are also numbered by district and categorised by avenues, streets and roads. 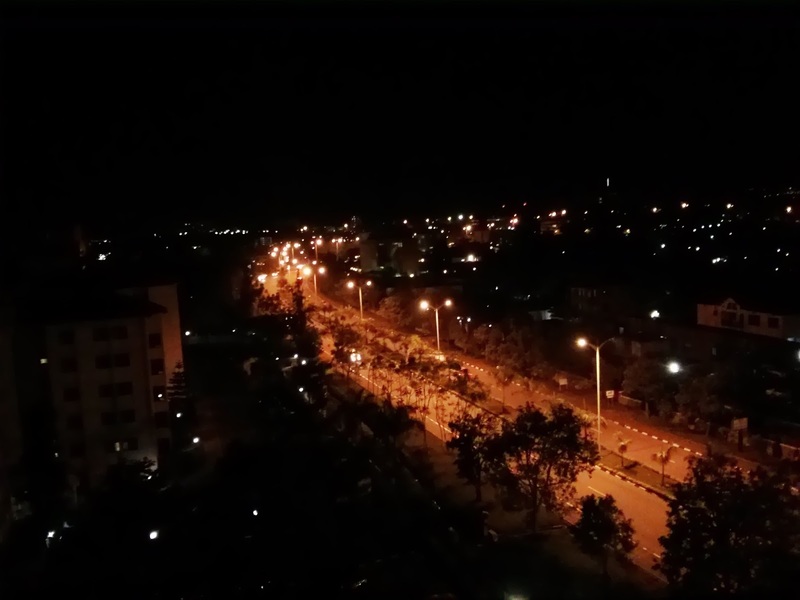 The centre of Kigali is KG for Gasabo district while a number of government buildings are in KN (Nyarugenge District (http://www.kigalicity.gov.rw/spip.php?article1113). Running down most Kigali roads are reflectors, or cat's eyes that glow yellow at night, guiding you as to where the lane separator is. Junctions and places where the road splits are marked with red reflectors that blink. Exits are marked with green reflectors. The traffic flow here is also a far cry from what we have in Nairobi, vehicles are well driven with not much of the unnecessary lane switching we have in Nairobi. Speed limits are also given some thought. They also have lots of motor cycles in Kigali, which they refer to as "motor", but these do follow lots of rules, and stop at traffic lights like everyone else. 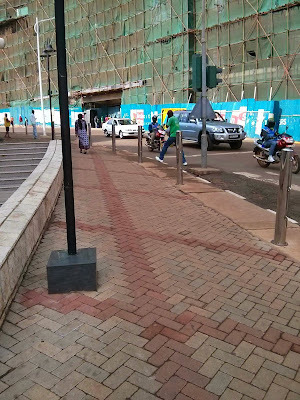 Yes, they do have traffic lights in Kigali, and they are quite functional. Being a cheapskate, I once evaded my taxi driver (in the guise of my phone running out of charge) and took a motor back to my hotel. Motorcycle users are mandated to wear a helmet, but lifted my visor (the glass bit) cause I wanted to have a view of the city. The helmets are cheap with the visors being barely transparent . The windy ride saw my visor almost blown away by the wind. The rider stopped and broke into laughter, clapping his hand and uttering something in Kinyarwanda. He did understand a bit of Kiswahili, enough for us to settle on the fare. Along the way, he did jump a few lights especially in deserted areas, but stopped at lights as we approached the city centre. Besides "motors" , you can travel around the city in a number of Toyota Rosa buses, which can be quite old with the interior needing some fixing, or in newer, shinier Kigali Bus Service buses. Travel to the country side involves 14 seaters and the same Rosa buses. Large buses are not common in the county, though. In the country side, you will notice that matatus (commuter vehicles)will flash lights and wave at each other as is common in Kenya when communicating about police whereabouts. Accidents are also a bit common in the countryside, especillay on highways such as the one leading to the Tananian border. 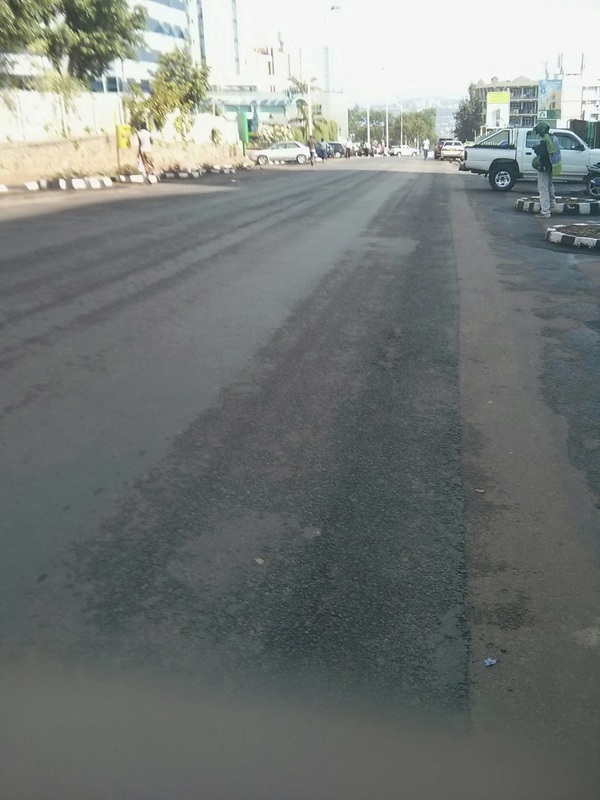 The roads here are narrower (6 metres such as in Kenya) compared to those in the capital. Such accidents will usuallu involve trucks, mostly foreign registered trucks and will usually result in deaths. We spotted an accident on the highway to the Tanzanian border - the remains of an accident 2 days old, and another accident later in the day. This was despite reduced traffic in terms of trucks - there were virtually no trucks on the road owing to cold diplomatic elationships between Rwanda and Tanznaia - which had expelled thosuands of Rwandans who have lived in Tanzania for decades (see the genocide section). Accidents here are taken seriously though, and will result in arrests of the offender - typically truck drivers. Armed policemen are stationed along junctions and pedestrian stops, though fewer locations are manned at night. I once remarked to our taxi driver that the only time one saw such a number of policemen in Nairobi, you are guaranteed that a president will soon be zooming by in a large motorcade. A few months ago, while doing the night rounds in Kigali, I did spot an armoured personnel carrier on the roads - not sure if this was just a random sighting or the army does patrols with them at night. I have also spotted army officers on motorbikes escorting motorcades - the army here also handles functions that are normally handled by the police elsewhere, such as security functions for some dignitaries. There is also the sense of security - when in Kigali, one feels quite safe - the city, or rather parts of it, are alive through the night, and people go about their business. One also hardly comes across conmen in this city - probably something to do with the smaller population in the city and the increased security. While there is isn't much corruption in the country, I am told that Kenyans are usually targeted for bribes by policemen, who can flag you down and ask to see a form of identification. For Kenyan passport holders, the demand was not outright, but rather suggestive. The same policemen however will rarely demand bribes from Rwandans, who do give the bribes, then go ahead to report the incident. Action is taken when such incidences of corruption are reported. Also, as mentioned above, you are unlikely to lose stuff as easily as you would in Nairobi. One however should not throw caution to the wind. Kigali also does not have hawkers, or rather, does not have as much of a hawker presence as in other cities. I did encounter a number of hawkers, some around the CBD, who will usually have items hidden in coats, then approach you with an offer. A few streets in down town, there were lots of people idling around in the street, a good number who were would approach you hawking some Chinese smartphone. While the city is safe in terms of what we refer to as "normal robbery" in Nairobi, there have been occasional incidences of grenade attacks, especially around the city's main bus terminus. The issue may be political and linked to the 1994 genocide. The genocide was the culmination of years of tensions between the Hutus and minority Tutsis. Under Belgian colonisation, the Belgians instilled a division between the Hutus and Tutsis, issuing separate identity documents for each and favouring the Tutsi, who were in power. Hutus took power in a 1959 uprising, which drove some Tutsis into the neighbouring countries. Successive Hutu governments continued with the policy of discrimination, further driving it even in schools. The Belgians continued with their influence, this time round backing the Hutus against the Tutsis. The early 1990s saw the Hutu government begin importing and stockpiling machetes for elimination of the Hutus. Government supported militias also emerged, with the sole aim of eliminating the Tutsis wherever they may be in the world. Then, the Tutsis had started demanding recognition and equal rights - things had started going bad in Uganda, where most of the Tutsis had fled to and Museveni was been forced to favour his countrymen as the demand for resources including jobs increased. A small number of rebels had fought with the government then, before coming to an agreement, where a number of diplomats and rebels would be stationed at the parliament buildings in Kigali. The Hutu government then had speeded up its preparations for the genocide, which was triggered by the shooting down of a plane carrying the Rwandan and Burundi presidents, both who died in the incident. The genocide then spread out, with the government using government officials to spread machetes and other arms. Notable for their role in the genocide was the government supported Interhamwe militia. Targeted in the genocide were Tutsis and moderate Hutus( Hutus who refused to take part in the killing of Tutsis) . The media was also used to drive propaganda and fan the genocide. The Rwanda Patriotic Front, led by current Rwandan President, Paul Kagame, brought the genocide to an end. The Interhamwe and other parties that took part in the killing fled to the Democratic Republic of Congo, then Zaire, where the Hutu - Tutsi conflict continues to date. This has resulted in Rwanda being on a continuous heightened sense of security - as there are extremists who are still keen on continuing with their role in the genocide in the region. For more on the genocide, there are a number of memorials across the country, with the Kigali memorial being one of the larger ones. The parliament building, which was attacked by government forces when the genocide began still has bullet holes and shell marks, and a gun mounted at the top. You may also visit this while in Kigali. To note, is that when many foreigners cannot tell the difference between Hutus and Tutsis, it is deeply frowned upon to enquire from a Rwandan if they are either of the two. As I have narrated above, there are scars that remain from almost 50 years of the two being driven against each other, despite speaking the same language. Things have improved a lot since the genocide - many in Rwanda will tell you that nothing was left, especially in Kigali, after the genocide. Most of the country has been re-built in under 20 years, including the shiny buildings in the capital - one things to note when comparing the country with other countries. As a result of the genocide, you will note that there is a growing number of Muslims in Rwanda. This is due to some of the atrocities having happened in churches and the fact that Muslims hid those targeted for killings during the genocide. You will also note that there are no dogs in Rwanda. A few months after the end of the genocide, Rwandans killed all the dogs. See, during the genocide, the killings were so bad that dead people were left everywhere in the open. The dogs ate these people, hence leading to a bad association to the genocide. Also, to this day, bodies of those murdered in the two months are still found around the country. Such people are collected and are properly buried on April 7th. Note: Be careful discussing the genocide in Rwanda, they do have strict laws against genocide denial. So far, Kenyans love Kigali due to the orderliness and security of the city. It is a far cry from the chaos of Nairobi, and the smaller population of the capital is a breath of fresh air compared to walking down Moi Avenue or Tom Mboya street, where one has to brush shoulders against a barrage of thousands of people, matatus, bodabodas and conmen. All this as one tries to find space to walk on that isn't occupied by hawkers. 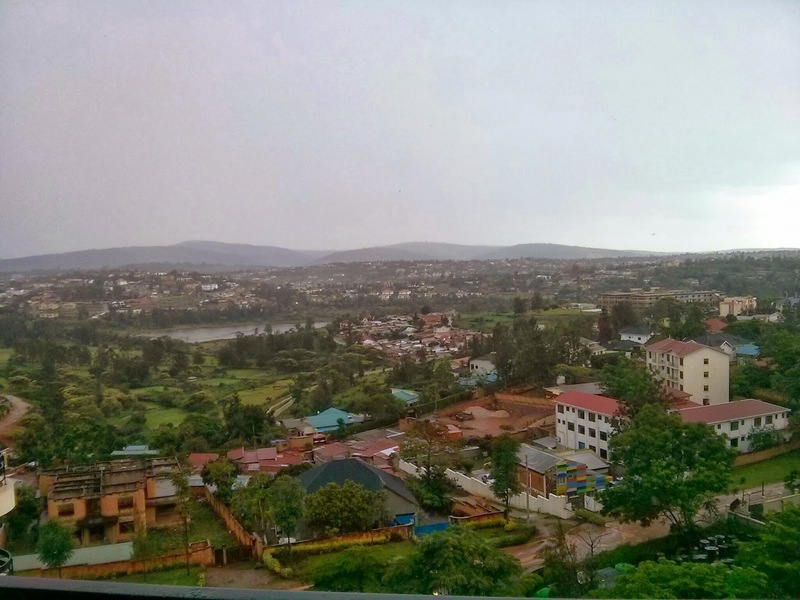 In Kigali, there is the feeling that systems are working, and that the city is with direction, headed somewhere. Thanks for reading the first part, for more of the story, like me on either Google+ or my Facebook Page, or follow me by email for alerts of when I publish the next piece.